Well, for one, I haven't been doing to much knitting! Last year, a small north east chain of fabric craft stores went out of business, and while I got some wool, (they didn't really carry a big selection of wool) I got some unfinished wood frames, and beads and jewelry findings, and fabric... and a bunch of other crafty stuff. And I've been sewing, and jewelry making, and framing photographs..
Not much sewing.. but I did get 2 craft bags made, (one was part of a yankee swap at Thursday night's Bobmas party (a Ravelry thing)--I was anxious that it would be a disappointment.. (the idea was yarn, but wasn't limited to yarn) but it was swapped and Jesh ended up with it.. (and 1) managed to convince others not to take it from her, 2) did a better job of photograghing it!) --I've also done some mending for my Daughter-- not even a hours worth. I've hung some photographs, and some plaques, --including a copper Failte (Welcome) but the arrangement was simple, and collection, small—just 15 small (mostly 4X 6) photographs. Now I have another Four 4 X6 photographs, and a half dozen 5 X7's to add to the mix. The photographs, most of them are pictures of my grandchildren, (courtesy of my DIL, and son) have been mounted in the finished frames, but not yet hung. As mentioned, I bought unfinished frames, so I first had to sand, and paint (and add hanging hardware) so its not like I just bought some prints and put them into frames! I'm at the turning point on my socks.. (the heel turning that is) they are looking good—you'll have to take my word—I haven't photographed them! 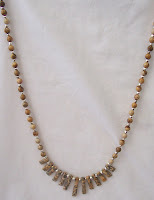 I love jasper, too - I rhapsodized in one of my posts about Rainforest Jasper, in fact. It's such an interesting stone with its striations and variations in color. So I'm three weeks late finding this post... I never one was for timeliness! I love that you've included some of your bead work here. What a multi-talented woman you are!